There is an innumerable amount of tool companies out there in the US right now. Too many to list here, in fact. Some go for a more broad appeal, throwing their skills at several different walls, to see which one actually sticks. Some prefer to go niche, focusing all of their efforts on making one product better than anyone else out there. Today, we’re focusing on a company that tries to do the former, but definitely is a very specialized company. Because no one makes a power tool, like Dewalt. 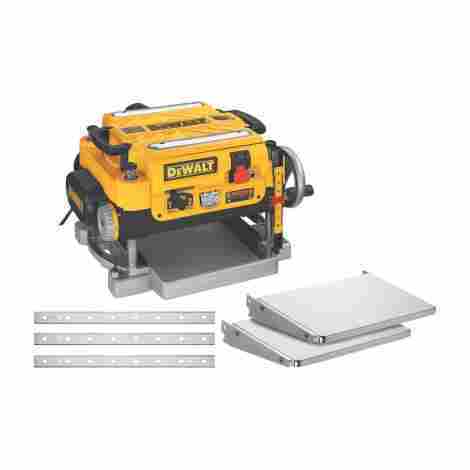 Kicking off this list on the right foot, we have the Dewalt 10-Inch Compact Job-Site Table Saw. Table saws are the kinds of saws you, well, put on your table. They’re mostly for cutting lumber and other such objects, and in our opinion, no one does it better than Dewalt’s model. The outer shell you see, specifically the set of black steel bars you see on the outside of the saw, is known as the roll cage. This is what keeps the mechanism that actually runs the saw working properly. Construction sites, where you’re most likely to find a saw like this, are dangerous places, so having a layer of steel to keep this expensive piece of equipment from getting smash is a definite plus. When you're working a table saw, accuracy and precision are what you need to get the job done right and fast. And this table saw helps you achieve that via a cast table top design. 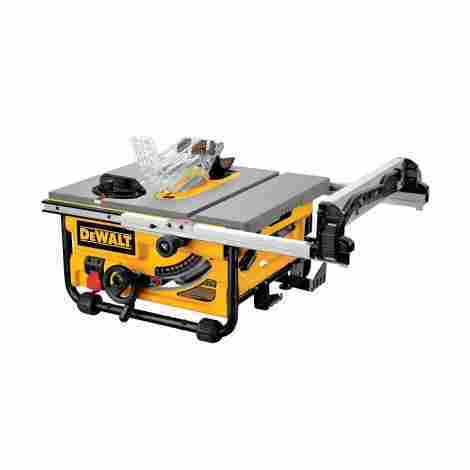 Now you don’t have to worry about the surface of the table saw itself getting in the way of that perfect clean cut. It should be to the surprise of no one that this table saw isn’t the cheapest thing on this list. In fact, we daresay this may be one of the most expensive entries on the list. But if you want the best power tools that Dewalt has to offer, look no further. 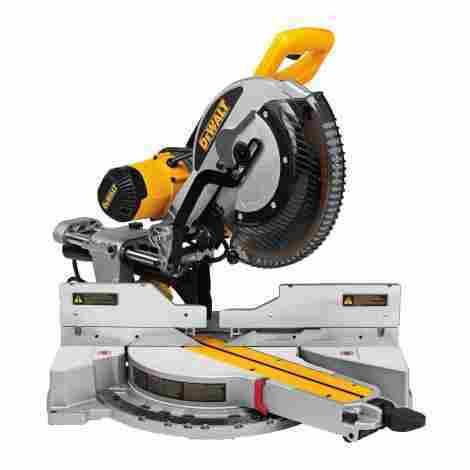 In second place, we have the Dewalt 12” Single Bevel Compound Miter Saw. In similar fashion to the previous entry, this saw is meant to cut the things too wide or thick for normal saws. But whereas the table saw cuts horizontally, this cuts vertically. Let’s see what sets this miter saw apart from the crowd. We’ve all been there, you have this great project in the making, everything is going smoothly, but along the way you come upon this angle you need to saw a board into, but you just don’t see yourself doing it with a normal saw. The miter saw is your only hope, but it’s diagonal, not vertical. Fortunately, this saw can freely adjust to suit your needs, whatever they may be. Whatever angle you need is yours to adjust to. That awesome, gnarly looking carbide blade may cut through everything you pit it against like butter for now, but how long do you think that’s going to last? Eventually, you will need to switch out, thankfully Dewalt has got you covered. Included with this saw is a blade wrench made specifically for the bolts on this saw. So now you can take out and put in whatever blades you need. Like before, it should come as no shock that this thing costs quite the pretty penny. Under some circumstances, we’ve even found it being sold for even more than the previous entry. 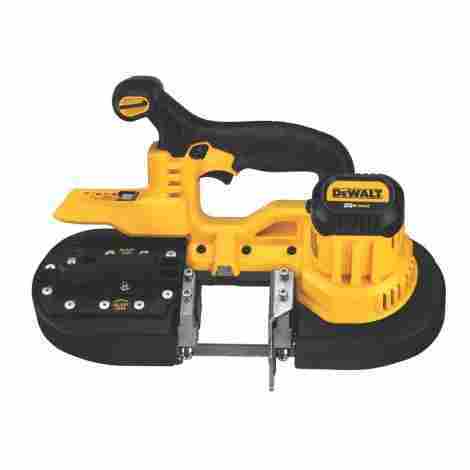 Finishing up our top 3 segment, we have the Dewalt Two-Speed Thickness Planer Package. A thickness planer is what you use to trim down an entire board to a certain thickness. This is when you do need the entire board, but you need it much thinner than it already is, and you don’t have the time to whittle. When you’re on the clock and pushing that deadline, you don’t have time to worry about the planer’s ability to take the heat. But with this planer, you won’t have to, as its 20,000 RPM motor can handle those wide and particularly thick cuts with the greatest of ease. The knives of a thickness planer are nowhere near as expensive as the thickness planer itself, but that will hardly matter when they keep breaking, and the price keeps adding up. Fortunately, this planer comes with a 3 knife cutter head, that has triple the lifespan of a normal thickness planer cutter head. This is, without question, the priciest entry on this entire list. It easily trumps anything else that this list has to offer. Which makes sense, seeing as how this is a professional grade piece of equipment, not really meant for commercial use. 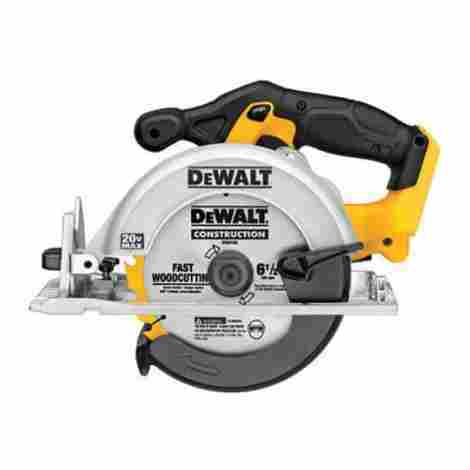 Coming in at #4, we have the Dewalt 20V circular saw. Although technically imported, this deluxe class circular saw delivers all of the quality that you expect out of a Dewalt power tool. And it more than earns a place on this list as one of the best saws that the company has to offer. When you’re using a circular saw, what you want out of it is power, precision, and speed. You don’t want anything between you and the other side of that board, and all the board in your way is about to learn what happens when you’re crossed. Which is why this saw is equipped with a powerful 460 MWO motor with speed up to 5,150 RPM. The saw shoe is the metal rectangle you see surrounding the saw that’s meant to be pressed down on the wood when you cut. The saw shoe of this circular saw is made of incredibly strong and lightweight magnesium. Meaning that it won’t weigh you down, but it won’t hold you back either. While not as pricey as the previous entries, not by a longshot, it’s still rather expensive for what it is, so be wary when you go to buy it. However, also know that you will be getting your money’s worth. 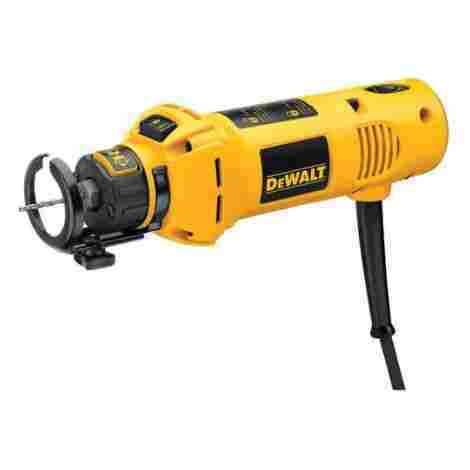 Coming in at #5, we have the Dewalt Rotary Tool. Otherwise known as a Dremel Tool, this power tool’s job is a varied one. It can be used for sanding, grinding, buffing, and even shaping. So what else does this bring to an already very versatile table? Well, let’s find out. Half the battle of using a rotary tool is knowing when to turn it off when using it. If you keep it on too long while, say cutting into drywall, then you may end up putting your work back by days. Fortunately, when you decide to turn it off, doing so is as simple as giving the tool the right bump. The turn on bump off switch allows for quick, easy turn offs for optimal efficiency. Rotary tools are already rather slim machines by design, but they can also be heavy, so using them for long periods of time, with the vibrations from when the machine is turned on added onto that, can cause a lot of fatigue. Which is why this rotary tool goes for an even slimmer design than usual, and takes off a lot of the weight, drastically reducing fatigue. Thankfully we’re out of the triple digit range for now, and back to the more affordable territory. This tool is very affordable for what it’s offering you, giving you a very good deal on a very good rotary tool. 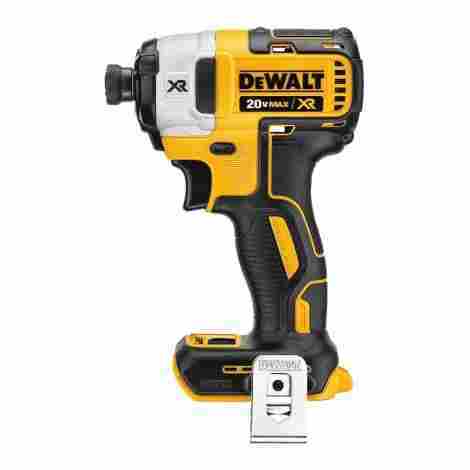 In our #6 spot, we have the Dewalt Li-Ion 3-Speed Impact Driver. This is a type of screwdriver, only much, much faster than your run of the mill screwdriver. This is purely for those heavy-duty screws that need to be driven into their targets just below the speed of sound in order to go in properly. And as always, no one does it as well as Dewalt. This impact driver is equipped with 3 different speed settings to give you that extra bit of versatility. And with the precision drive system, you have more than enough control to make those precise drivings no matter how fast the machine is running. If there is any specialty that Dewalt is known for when it comes to their power tools, it’s their patented brushless motors. This design flourish makes the motors much smaller without sacrificing too much power, leading to a more compact design. This means that you can make those tighter spaces because this impact driver is smaller than most. Obviously, a much higher-grade impact driver than most would cost more than most. Although the price is nowhere near the amount is shown in the first three entries, it’s still a little bit pricey. 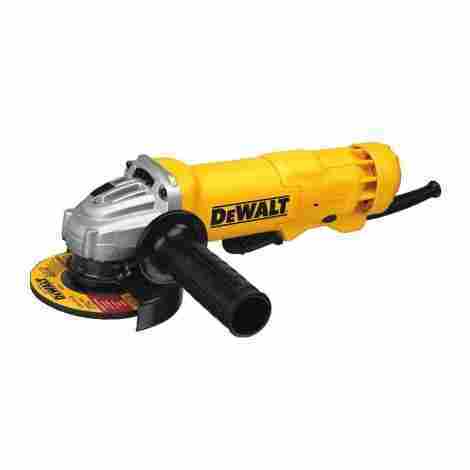 In our #7 spot, we have the Dewalt Lithium Ion 4 ½ inch Grinder. A grinder is about as self-explanatory as it gets: it grinds things. Whether it’s wood, metal, stone, or whatever else depends on the grinding wheel you attach to it, but whichever you choose, make sure that you’re attaching it to this excellent piece of equipment. One problem that a lot of people have with power tools like this is the fact that you need to use a special kind of wrench (that is small and very easy to lose track of) to get the grinder wheel off. A problem that this grinder seeks to correct, through a quick-change grinder wheel that very quickly gets off the wheel without the need of any such wrench. One staple of the grinder is the side handle. A handy little handle that’s there purely to give you that extra bit of control when grinding. And this is a side handle that you can hold in one of two positions, giving you a greater amount of control and comfort. This grinder may come off as a little pricey to some people, but for what it is, we think it’s a very reasonable price. Kicking off our final 3 entries, we have the Dewalt High Torque 1/2" Impact Wrench. Impact wrenches are different from impact drivers, in that while impact drivers are essentially high velocity power drills, these are high velocity ratchets. They do what your run of the mill ratchet does, except faster and stronger. And if you want the best of the best in that regard, then you come to this one. Torque refers to the twisting motion made by things like drills, ratchets, and impact wrenches. And in terms of impact wrenches, in particular, Dewalt has them all pretty much beat. No one can match the torque that this thing puts out, having a whopping 700 ft./lbs. of torque. Even with the more durable power tools out there, if you drop it off the side of your house, and it lands on the concrete, it’s probably done for. However, this thing can take a drop onto pure concrete from up to 6 ft in the air. Making it one of Dewalt’s most durable products that they’ve ever put out. The big problem with this product is the price. Sometimes it won’t be too high, but other times it will be obscenely expensive. The pricing is not all that consistent, except for the fact that it is often very high. For our second to last entry, we’re showing off the Dewalt 20V Band Saw. These saws are primarily used in lumber mills since they’re pretty much the best kind of saws for that kind of work. They consist of a saw mechanism, with a long band-like sawblade that goes back and forth. And as always, few people do it as well as Dewalt. With other band saws, you have to deal with a saw handle being off to the side where control is limited, and handling is cumbersome. But this band saw puts the handle at the very top, giving you an excellent amount of control over the saw, and thus more able to make those precise cuts that you need to make. It can be hard keeping control of such an unstable blade like a band saw without some help. Fortunately, this band saw has you covered on that front, sporting a pair of dual bearing blade guide rollers that will keep your blade in place without letting it stray too far off course. Since this is, of course, a professional grade piece of equipment, meant more for the lumber mill than the garage, it’s a bit more expensive. However, it’s not as expensive as the pricier entries on this list, so at least you won’t have to spend too much company money to get this. 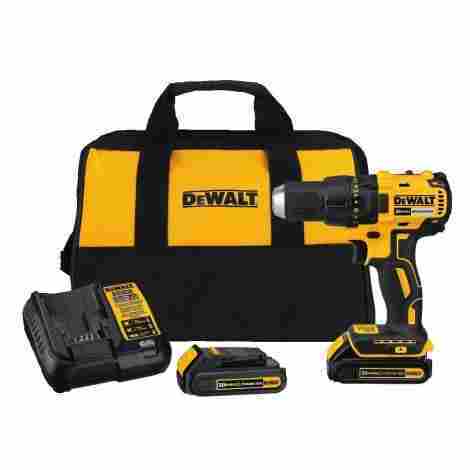 For our final entry, we have the Dewalt 20V Brushless Compact Drill/Driver at #10. 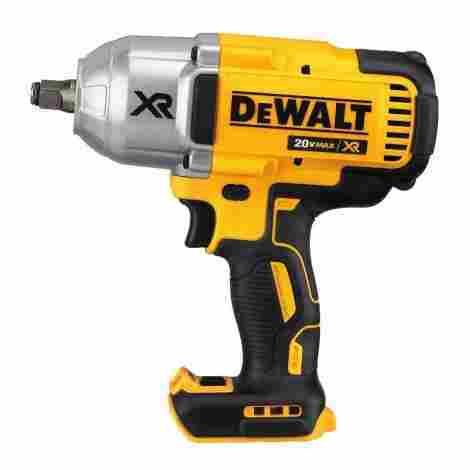 Since we’ve seen how expensive both a drill and an impact driver can be, Dewalt thought “why not combine them into one and just sell that?” And what results is an excellent power tool, offering both services at a more reasonable price. There come times when you must screw in/unscrew something that’s in a space where you wonder how the person expects you to do so because of how cramped it is. We’ve all been there, and we’ve all wished we had a driver like this one, which is small enough thanks to its compact brushless motor to fit into those tight spaces. The transmission is another word for the motor, specifically the parts of it that you can actually control. And this drill comes with a special, high speed transmission, equipped with a 2-speed setting that gives you almost complete control over the speed of the drill. This is a drill and an impact driver combined into one, and the price reflects that. It’s a good bit pricey, but nothing unmanageable. If you absolutely need a tool like this, and it is a useful tool to have, we should make that clear, then there’s no reason to pass this up. Like we’ve been saying this whole time, there just isn’t anyone out there who does power tools quite like Dewalt. Yes, other brands have their shining moments, but Dewalt specializes in making high quality, professional grade power tools that will almost always get the job done better, faster, and more efficiently. If you need further proof of this, look no further than the fact that a decent chunk of these was listed to be more suited to professional environments than a hobbyist’s garage. Dewalt doesn’t mess around, the stuff they make is designed to get the job done in a professional, efficient manner. There’s just such a polish and efficient design to pretty much everything they do that it’s astounding that they haven’t chased out the competition (though the prices their products come at as a consequence of this professional quality probably has a lot to do with it). We can say with all certainty that none of the entries we’ve showcased here are bad, despite the form this list took being that of a ranked list. Every single one of these items is worth being a part of your toolbox and will serve you well in whatever niche they’re designed for. So, if you need top of the line power tools, if you’ve tried the rest and now want the best, then you need to look no further than Dewalt. You’ll wonder why you settled for anything less. This was a tough list to compile, in all honesty. Which was not to say we were at a loss for potential candidates, but actually the opposite. We had too many options because this was an incredibly broad topic. And unfortunately, this also affected what we could do for criteria. If we were doing power drills specifically, we could get down into the nitty-gritty with specs and subtle differences between each entry, but for power tools in general, we needed to come up with criteria that were equal parts broad yet specific. And with all that said, we like to think we came up with a pretty good list, all things considered. When discussing power tools, which, if they aren’t powered by cords plugged into walls, are usually powered by battery packs. And with that in mind, the lifespan of those battery packs then become a large criterion. Not for the battery packs themselves, of course, but rather for the tools. Because it doesn’t matter how much power the battery pack can hold if the tool it’s attached to eats through it within an hour’s time. How much battery the tool consumes depends largely on the amount of time you use it and the length of time that you use it. This then translates through how much energy the tool consumes by default, which is usually decided by what kind of tool it is in the first place. For instance, a power drill is typically going to take less power per user than an impact driver, because an impact driver needs more energy to generate its output. This refers to one thing and one thing only: how easy it is to use the tool in question. Because it does not matter how well made an item is if it’s a pain to hold and a bigger pain to use, we imagine you would not care about how well it works. Ergonomics is one of the most important hurdles for any tool design to get over. How well a tool is designed will decide a lot of things. Not the least of which is how long you can actually use the tool before fatigue starts setting in. As such, ergonomics concerns both the lightweight nature of the tool in question as well as the compactness of that tool. When you buy a power tool, you do so with the intent of making your work more automatic, at least in part. Not necessarily to leave all of your work to our future machine overlords, but more to just take out the pointless busy-work of it all. As such, we judged this criterion based on how much work the tool did for the user, and how more efficient they made their part of whatever project you’re using it for. Now, for Dewalt power tools, this wasn’t too hard. They’re a company that knows what they’re doing when it comes to making high-class power tools, so this was a relatively easy criterion to judge. These things are expensive, just in case you haven’t picked that up quite yet. They cost a lot of money, even when it’s just one item. As such, it would be rather annoying is, no less than 5 minutes after you shell out $280 for a new impact driver, the thing just falls apart on you right there in the parking lot. This plays into one of two things. It concerns both longevity and durability. Longevity is self-explanatory, it is the lifespan of the tool in question. Power tools have a funny relationship with this concept, as some power tools are built to last for decades, while some you’ll go through in a few years at a time depending on how often you use them. And that is the rub. Longevity has everything to do with how often you actually use the tools. If you only use them once or twice a month, you’ve pretty much had a tool that’s going to last you the long haul. But if you have to use a tool for, say, your job, then that tool may not last you as long. Durability specifically refers to how much damage the tool in question can take. This is particularly important if you work in construction, where the chances of you dropping your tools off a piece of scaffolding are very high. Fortunately, this is another criterion that we learned very quickly was not going to give us any real problems. Pretty much every power tool made under the Dewalt brand was made from some kind of high-quality steel and wired with only the best motors and technology. As you can tell, this was a criterion that we relaxed on, since every candidate we screened passed this test with flying colors. You may have noticed that there are a lot more intricate tools on this list than you may have initially expected. From table saws to planers to band saws, there were a lot of unique choices, which was completely intentional, as we wanted to shake things up from the usual suspects you see on lists like these. But with that said, it became more important than usual to focus on the ease of which you set up these machines. Because once you get more intricate with your machines on your list, the more the question becomes “okay, but how easy is it to actually set up and use these things?” which is a valid concern. As such, we judged each entry by how easy it is to set them up, as compared to other tools like them by other brands since we felt that was the fairest option. For our final entry, we have a price. Price was, at the same time, one of the easiest and most complicated criteria to screen. Because on the one hand, it seemed so simple. Of course, the table saw, and planer is more expensive than the power drill. But then we came across the impact driver that went for an asking price at least three times what it’s arguably worth. Like we said, complicated. So instead we judged each entry like we always do: by how well they can justify those massive price tags. And as always, this evened things out and made the proceedings a lot simpler than they otherwise would’ve been. For our final segment, we’re going to be looking at frequently asked questions concerning Dewalt power tools. Now there aren’t quite that many of them, but the ones we’re listing here are the ones we felt were the most important. So, with that said, let’s get to it. Q: You’ve said a lot of pretty words, but let’s get down to the nitty-gritty. What is it about Dewalt power tools that make them so special? A: In a word, efficiency. Look back through this list, and you’ll see that so many of the perks each of these entries has to their name are how much easier they are to use than your run of the mill power tool. Dewalt power tools are so beloved because they make things easier on the user when they’re using them. As an example, let’s look at the brushless motor that’s so prevalent in their work. A brushless motor can put out the same energy as a normal one, while also being smaller. That means that a power tool with a brushless motor can fit better into tight spaces where it would otherwise be unwelcome. So, when you ask what to look for in a Dewalt power tool that you just can’t get anywhere else, then you need to look for ergonomics and efficiency. Q: Is there any kind of tool that you believe is absolutely mandatory for any handyman to have in his toolbox? A: A power drill, without question. If you’re feeling like some overkill, you could get an impact driver, but that’s meant for tougher jobs, and would eviscerate most commercial screws. A normal power drill should be considered mandatory. You can work with a manual ratchet, most people do, in fact. But screwing in a screw with a normal screwdriver is easily one of the most tedious parts of the construction process, and there’s a lot of guesswork as to whether or not you’ve really gotten it all the way in. Meanwhile, with a power drill, you know when you have it in as far as it will go. Q: Why did you include so many unorthodox power tools like planers and band saws? A: Mostly because we felt like it. It was a nice departure from the usual suspects of power tool lists like these, and we wanted to show off some unique tools. But another reason would be that we wanted to show off the extent of Dewalt’s influence when it comes to power tools. You wouldn’t find these items on a list about, say, Craftsman power tools. Because Dewalt is one of the most trusted names in the professional market. Construction crews all over the country, heck, all over the world, are using these tools even as we speak. So there really isn’t any higher reason than that for including these tools on this list. There doesn’t need to be, in our opinion.